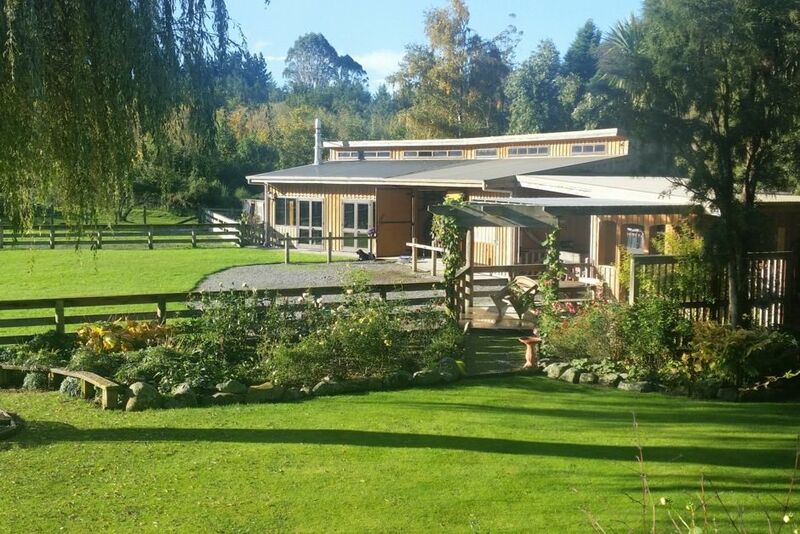 Situated in a quiet paradise on the edge of Waihi bush looking straight out to Waihi peak and built within a stroll to the Waihi river, the barn is a true escape from city life, less than 2 easy hours drive from Christchurch and 10 minutes drive to Geraldine. Purpose built for accommodation, the barn is very spacious with a high vaulted ceiling. It comprises an open plan living/kitchen and numerous options for open plan sleeping (6+ and well suited for a couple/ family or group. Take a holiday from your cell phone and screens - we are proudly back to basics (no internet or cellphone but does have TV and a landline available for emergencies!). You may choose to just enjoy the tranquility of the ponies and other farm animals and we have a well loved country garden. We enjoy carriage driving; our ponies are driven most days during summer. Chickens and sheep provide a full "farm stay" experience but with the privacy of some distance between the barn and main house. The barn is just a short drive from Geraldine, where we enjoy all the facilities of NZ's favorite small town. Great coffee and cuisine and the opportunity to sample a unique movie theatre, bush walks, locally produced gourmet cheese, chocolate and fruit products await. Cleaning will be provided for $50 per stay. Linen hire for $5.00 per person. We, a family with two boys of 8 and 6, really enjoyed the place. Spacious and with amazing surroundings. The boys loved to follow Steve around the field doing farm stuff and going to the river to play. We loved the BBQ, the peace and the harb garden. Lovely place and lovely people. Lovely appreciative family. The children made the most of their opportunities as did their parents, who also left the place spotless. We would love to see them again. Lovely house, the host is very kind and helpful, the kitchen prepared everything you needed.Very enjoyed the staying! The location was amazing, a tranquil and relaxing space with native bush, birds and rivers surrounding the area. We loved our stay and it was perfect for our family occasion, with the open spaces, gardens and animals keeping the kids occupied all week! It was beautiful, and although the weather wasn’t 100% the barn stage, board games and book selection were all well used, we loved our stay and would definately stay again! Thank you Bindy and Steve. Bindy & Steve treated us like family even though we were there for just one night. Our seven kids loved the ponies and the dogs particularly and the barn itself has got to be seen to be believed. So many wonderful little touches. We had beets, lettuce, lemons, spring onions & parsley from the garden. there was plenty of hot water for our big family and the fire kept us warm & cozy. Well worth the detour off the main road. Thanks Bindy & Steve. This delightful large family were appreciative and respectful of their surroundings. We enjoyed meeting them and grateful that even with their large number they left the barn clean and tidy. We would love to see them again. It is such an amazing spot Bindy and Steve have. They were welcoming and very helpful with information on the area and assisting with any requests we had. The barn has all of the amenities needed and was extremely clean and tidy. We loved the feel of the barn, being able to watch the horses in the paddock and the river being so close. There was 6 of us staying in the barn and there was plenty of room for everyone. Hopefully we will be back in Geraldine in the future and can come and stay again! Beautiful location with river nearby and lovely views to the hills. Easy to relax in this place and not far from Geraldine for walks, coffee, ice creams.